It takes a great stride of perception to imagine what it must have been like, before the first man stepped on the moon. That day, when Neil Armstrong took his first giant step for mankind, he drew us through the looking-glass. For millennia we had been gazing at this great beauty, and now one of our kind was standing on her, and she became an acquaintance. Since that time we have become accustomed to a privilege accorded to a tiny proportion of all the peoples of all the times of the earth: we know what it looks like. close-up. There are no Selenites, as HG Wells speculated there could be. There is no man in the moon, leering maniacally out from some flickering monochrome circle. There’s dust, and rocks, and dead ghost seas. But imagine, if someone had shown you a great picture of her surface, as tall as a man, detailed as a map, before magnification claimed her? In the days when the telescope was still an expensive luxury, what if a man had the vision to create a huge representation of her surface of such detail it leaves one breathless? Galileo, it was, who first made a telescope sophisticated enough to see the hills and valleys of the moon. And inventors took the idea and ran with it, creating glasses which would see ever further into the heavens, until a music teacher from Bath thought bigger than all of them. This was his Magnum Opus. Herschel used it to watch the sky for 20 years, and on the very first night he used it, he discovered Saturn’s sixth known moon, Enceladus. William was great friends with a rather decent portrait painter. His name was John Russell. Born in Guildford high street in 1745, he was a bit of a religious fanatic. He kept a diary in an obscure shorthand , beginning the day he converted to Methodism at just 19 years old. The clear lines of this particular faith must have suited him admirably. Still, though he could be a bit of a bore, he still garnered friends in very high places. He was very good at pastels, and George III soon enlisted him to create pastel portraits of his nearest and dearest; and with that, all Court was clamouring for his work. But his great love was the moon. He loved its surface it an knew it as intimately as any at that time, and drawing it was his obsession. In 1784 he was introduced to Herschel And lo! The moon mapmaker had access to hitherto unthinkable magnifications of the moon’s surface. And to his eternal credit, he shared his findings. It took him 20 years, but he drew the moon in all its intricacy so that we could all imagine we were hovering in space, close to its surface. We could all see what only Herschel’s great monsterscope could see. And if you go to old Elias Ashmole’s cabinet of curiosities, the site of the old Ashmolean Museum and the present home of the Museum of the History of Science, and walk half way up the stairs towards the first floor, you will see a great round picture of the moon. And it is as stunning today, to me, as the day it was completed by its meticulous creator. He didn’t have to stand on the moon. 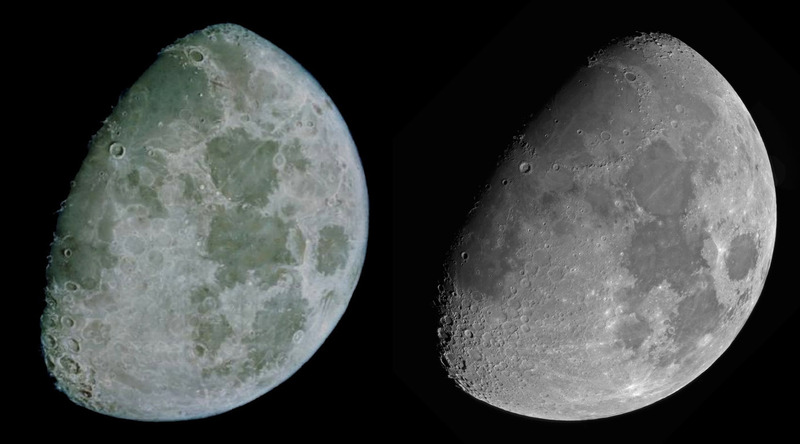 He created a vision which would help mankind understand for more than 150 years what the moon looked like, close up. Posted in Quirks of HistoryTagged astronomy, John Russell, moon, William HerschelBookmark the permalink. The almost full moon is beautiful in the sky tonight, so neat to see a post about the moon. I have been trying to take a photograph of the moon successfully for a very long time, Steven….lovely to hear about the moon in your sky. That was rather remarkable. I had no idea that someone had created such a drawing and I am quite curious about your comment regarding the clear lines of methodism. It is a beautiful thing to behold, Tammy. As for Methodism: it was for all, not just a chosen few, and this set of paintings could be seen by anyone, not just those who could afford the astronomical price of a microscope. He brought the moon to us as an extension of the ethic which is inbuilt to Methodism. And our Methodists here are characterised by a world view not muddied by pretension. 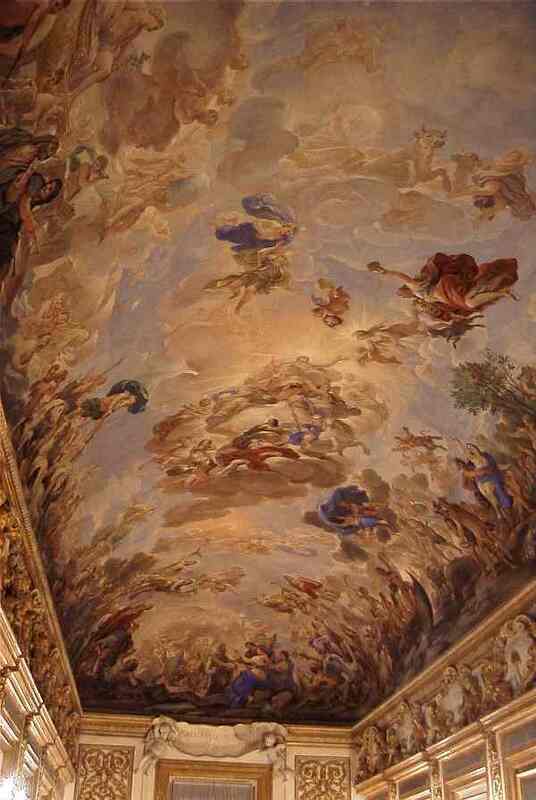 I can best explain by comparing the moon with another representation of the heavens, painted for the Medicis by Luca Giordano ( http://dickschmitt.com/pictures/tuscany99/11nov99-medici-riccardi-ceiling.jpg). The two are masterpieces, each in their own way. But one is clearer, far more easily readable, refreshing in an emotional and indeed spiritual sense. Finally, I have always seen Methodism as a movement which brought clear lines into a country of ambiguous faiths. Catholisism and the Church of England have always walked hand in hand with politics here. Somehow the lines of that moon have the same ring of honesty and accessibility to them. It’s not a clear link, but a gut feeling I have. He did a FANTASTIC job, Kate. Thanks for sharing. Pleasure, Nancy. he is quite a discovery. The moon landing is very specific for me as I was born the day they returned! Herschel’s telescope is amazing. I had no idea anything like that existed then. Nor did I, PT. Quite a revelation when I saw the painting on the stair. Extraordinary painter. I think the mind numbing meticulousness of work like that is what made me leave painting at art school, and become a photographer. I wouldn’t have been much cop as a Methodist. 😀 nor me, Roger, though I love the clarity it produces. 🙂 So glad to hear it, Debra. Thank you. I love looking at a huge, full moon and seeing that smiling face looking down on me. But I also appreciate the advances of science that allowed us all to have a closer gander at it … and the men who actually set foot on the moon. What a triumphant achievement that was. An amazing day when it actually happened, Judy. What an exploration that was, to stride out into space. That’s a mind blowing image Kate. 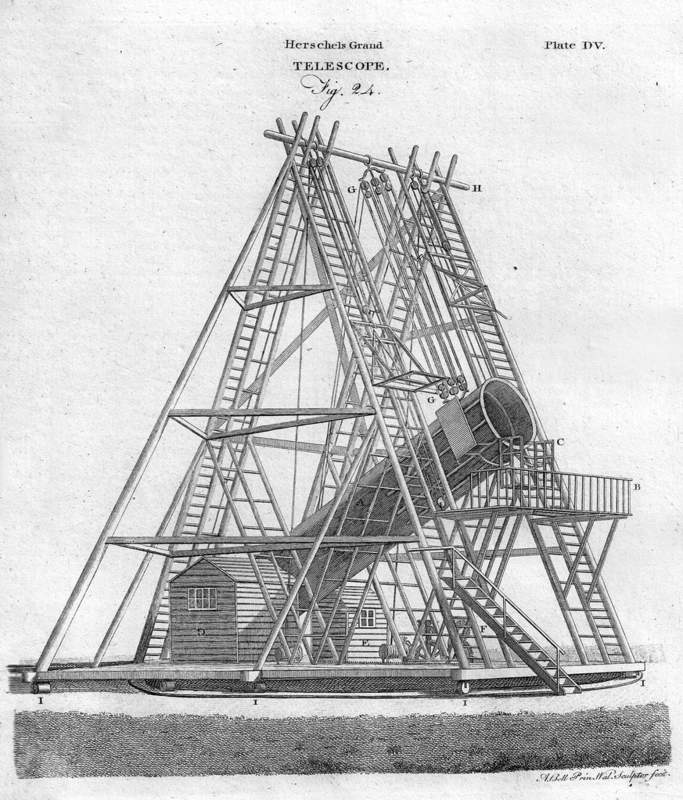 It looks so advanced proving that telescopes were pretty good even in the late 18th and early 19th centuries, Kate. It’s hard to believe that it was produced in an era when indoor plumbing was what, still a hundred years away? I know. The mind boggles. It shows the power of quiet, determined, if slightly obsessional observation. And his teenage kids would roll their eyes and never invite any of their friends over. And yet…his work endures. Oh if those kiddos could see his moon now. Ha. You’re right, Barb. Old Dad, off on his moon pictures once again. A bit like holiday slides. It really is, isn’t it, Charlie? Good to get a professional’s opinion. How I wish I had that kind of gift, Kate. Instead, I’ll peer at our full moon tonight and just imagine. The moon has always been a source for imaginings, hasn’t it, Penny? Incredible how stagnant space exploration has become, though. At the time of the moon landings it was felt that settlements on suitable planets or their moons was only decades away. It’s true. Why is that, I wonder? Money? I see the wheels so seems like oval track to turn which is an extra pinch of smarts as having the entire housing turn as opposed to have the telescope revolve. Seems more static, stable. It does, Carl. Impressive structure, isn’t it? That telescope looks amazing and Russel’s drawing even more so! Thank you for sharing this Kate.